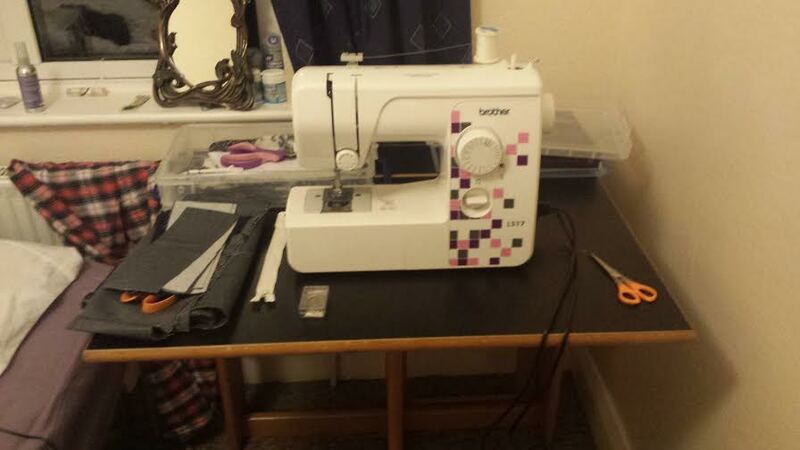 I now have my sewing machine in my room at my new place and have made two new things and am part way through a third. Conditions are a bit cramped when I have to get the ironing board out but I am really pleased that I am at least able to carry on. Sewing has been so relaxing. Don’t get me wrong, there have been some stressful moments, but I’ve still found it to be a surprisingly useful hobby to have when your life is otherwise busy and stressful. It sounds strange because it takes up so much time (and space!) but it requires a level of focus that means I’m just thinking about the garment and not stressing about all the other little things in life that could otherwise overwhelm me. I am pretty easily overwhelmed at the moment. As someone prone to anxiety, moving out of my loving and secure home with my other half and back into a shared house with four other people in a new city while taking on a new, but temporary, job that is hopefully the start of a new career but that will also require further study and many more temporary jobs before I am likely to be at a stable point in this career…well, all of this has been quite a big deal. I am exhausted and sometimes the anxiety can get overwhelming. I, albeit temporarily, no longer live with my other half, we live in different cities, I’m travelling a lot so that we can still see each other, I’m in a new job, I feel under pressure to accept any opportunity offered in order to stand out as candidate in a saturated field, I’m not sure how I’m going to pay for the further education the field requires and I am finding it hard not to have all of these things shouting away in my head all the time and when they shout, they start to drown out some of the quieter, good things in life. I am lucky to have found the person I want to marry, I am lucky to have gotten this work opportunity, I am lucky to even be able to consider further education as an option, I am lucky to have found a houseshare with both nice people and affordable rent. I know these things to be true but they can slip out of focus a bit when you are really tired and becoming trapped inside your anxiety. But enough about the anxiety, back to the sewing therapy! 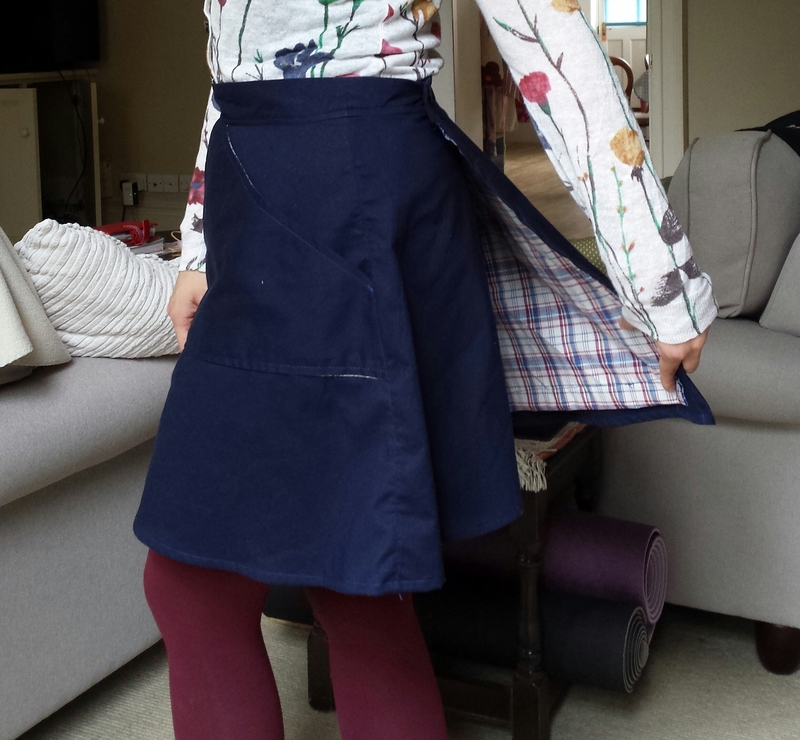 I decided to remake the Delphine skirt from Tilly Walnes’ book as my first attempt was such a disaster. I got some lovely cotton in a blue and white herringbone pattern. To add in an extra challenge I decided to draft my own pockets to go with the style. 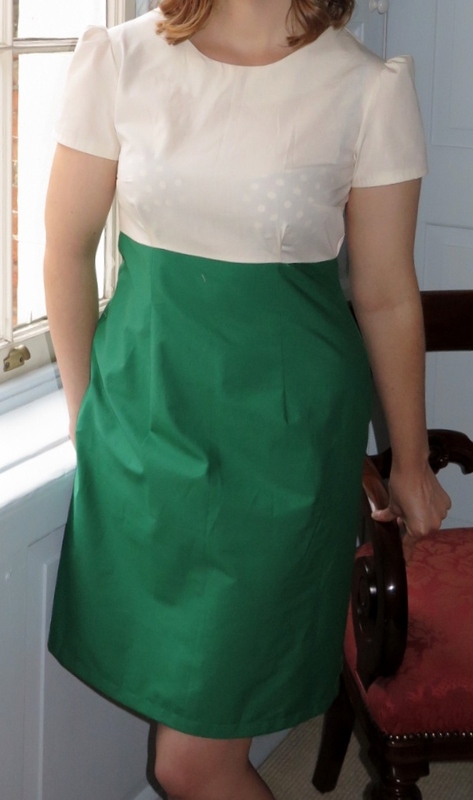 I love the giant pockets on the Miette skirt and have found them so useful for my job as there are areas at work where I am not allowed to take a bag but I still need my work keys, notebook, pencils, phone etc. It is so useful to just shove everything in my pockets! For this skirt I wanted large pockets, but internal and discrete looking one’s. 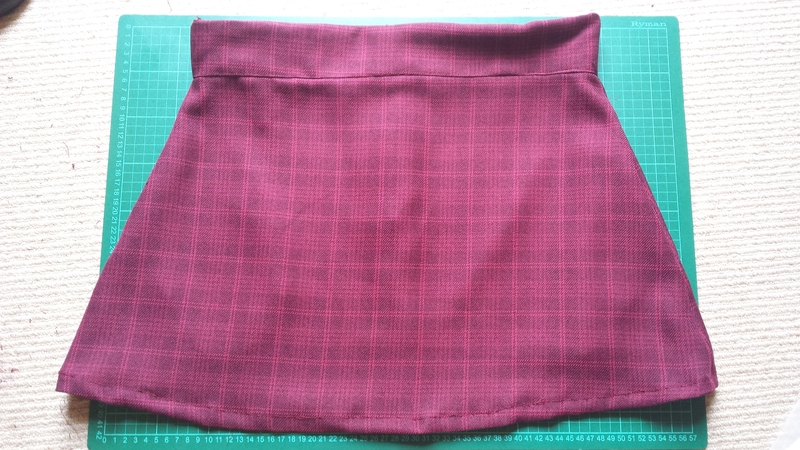 I wanted this skirt to look smarter and more office friendly than the Miette does. I don’t have very many good pictures, sadly, I have only my phone to work with at the moment and no one to take my pictures for me either so until I get better pictures, grainy, low light mobile pictures and a selfie in the grubby mirror in the Ladies will have to do! 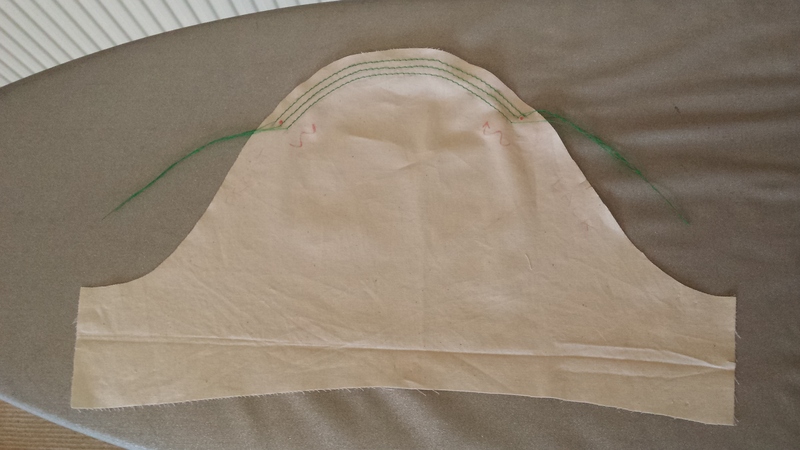 The pockets were simple enough and used the main shape of the front skirt pattern piece to create the shape. I made the pocket openings a little too narrow, in hindsight, but they are still big enough to get my hands, phone etc in there so they’ll do! I’m happy overall, especially with the pockets, but sadly on it’s second outing one of the seams split and it is now awaiting repair. The least therapeutic aspect of this project was the waistband. It came together easily enough but once again it was an awful fit. In a previous post I talked about the “Did I make a mistake, or is it my body?” question and I am starting to think that the answer is the latter. 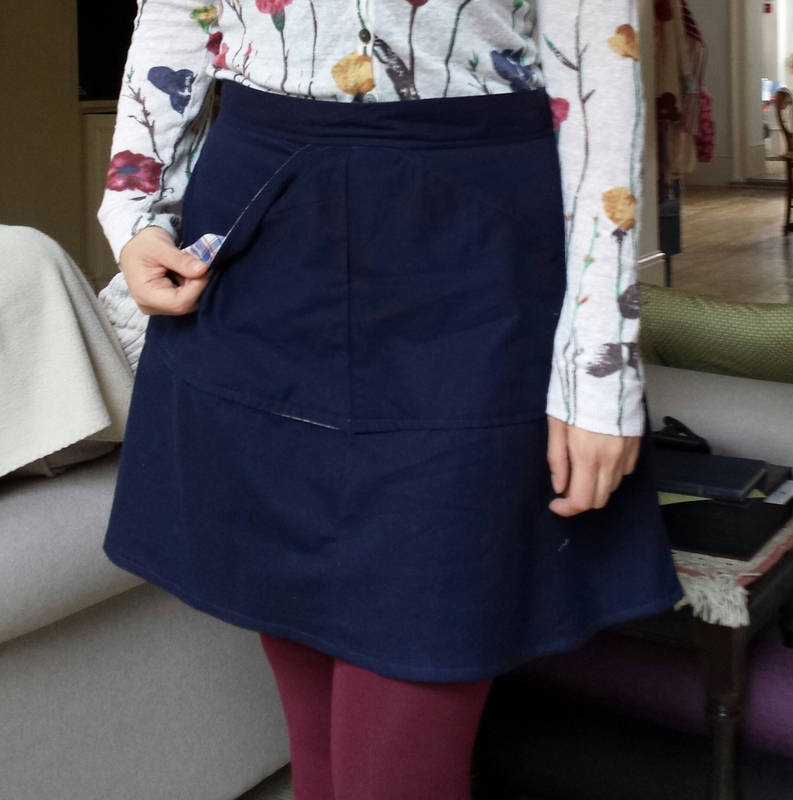 I am working on another skirt now, the Clemence, and I’m having the same issue with getting the waistband to fit. I think thick waistbands might not suit the twist and curve of my waist. I have a book on fitting, The Complete Photo Guide to Perfect Fitting, and I hope that this book will help me to understand how to correct what is going wrong but for now I don’t seem to be able to make a skirt that fits me well at the waist. Those who have read my previous posts on beauty standards, particularly this one, will know that I am not body confident. Though sewing has been an excellent quietener of my busy mind, it has not yet fulfilled the dream of helping me to feel more confident in my own skin. 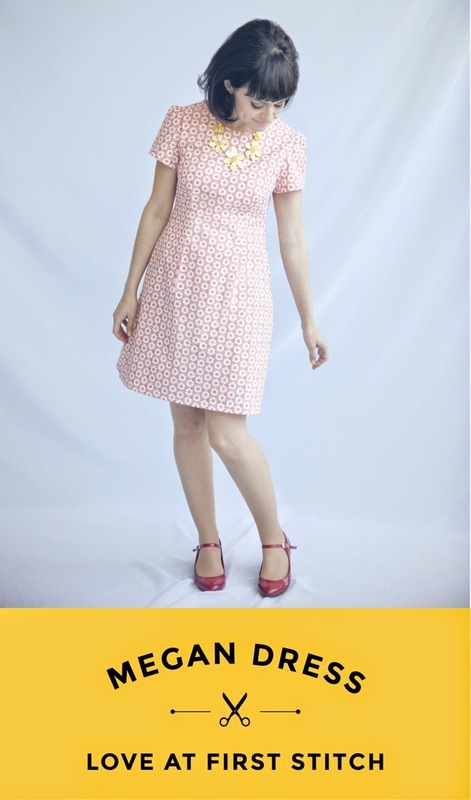 My next sewing adventure was with the Megan dress from Love at First Stitch. I am essentially just working my way through this book and I hope that by the end I will have the confidence to try out patterns from other designers. I’ve been waiting a little bit to write this post. 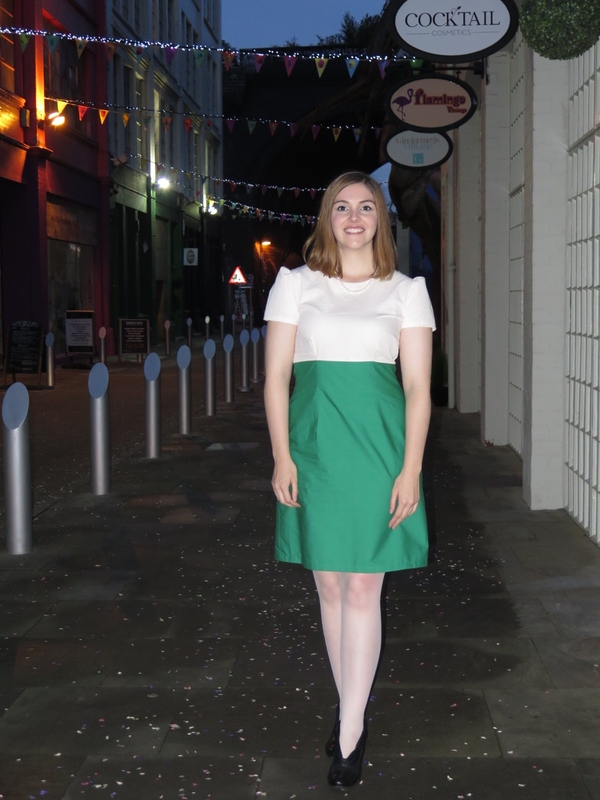 Firstly, because the finished Megan dress was worn to a wedding recently and I didn’t want anyone to know that I had made it myself as I was hoping someone would compliment my outfit and allow me my first ‘Thanks! I made it myself!’ moment. I am please to say that I was not disappointed. Secondly, because immediately after the wedding I started a new job in a new city and, frankly, I am exhausted! I am, on the whole, happy with my make. I really enjoyed making this dress and as it came together I felt better and better about it. I was so pleased with how I had matched the darts on the skirt and bodice pieces and I really liked the fit. I am still not brave enough to start combining pattern sizes so I just went with one size and was worried that I might come to regret that decision but I haven’t. Perhaps I am still too used to ‘off the peg’ standardised clothes that never quite fit me right?! I like the fact that it looks quite fitted and structured but has a fair bit of ease still. It isn’t a perfect fit, as the neckline gapes quite a bit, but for a novice I think it is a pretty good fit! I have ordered The Complete Photo Guide to Perfect Fitting and I’m hoping it will help me figure out how to identify and fix my fitting issues. We shall see! I am glad I added them because I have learnt a new skill and will, I hope, be less daunted when I tackle any later projects that have sleeves, but I do not like these sleeves. I was very taken with the dress when it was still sleeveless but, for me, the slightly puffed up nature of these sleeves make me feel broad and bulky. I don’t think they suit me and they aren’t really my style. It was frustrating as I had worked so hard to make the sleeves only to discover that they didn’t look very appealing on me. 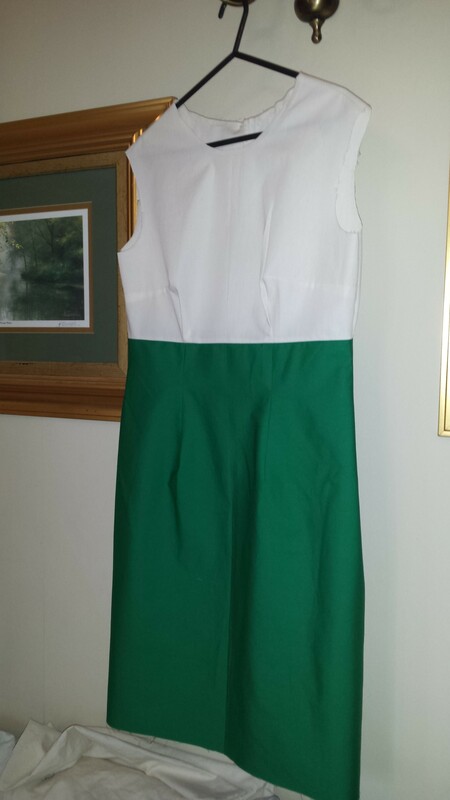 I may remove them and try to convert the dress to a sleeveless one at a later date. Apologies for the navy and polka dot bra that is clearly visible in the above picture. I couldn’t wait to try it on and didn’t think about my underwear! The below picture was taken at the wedding. 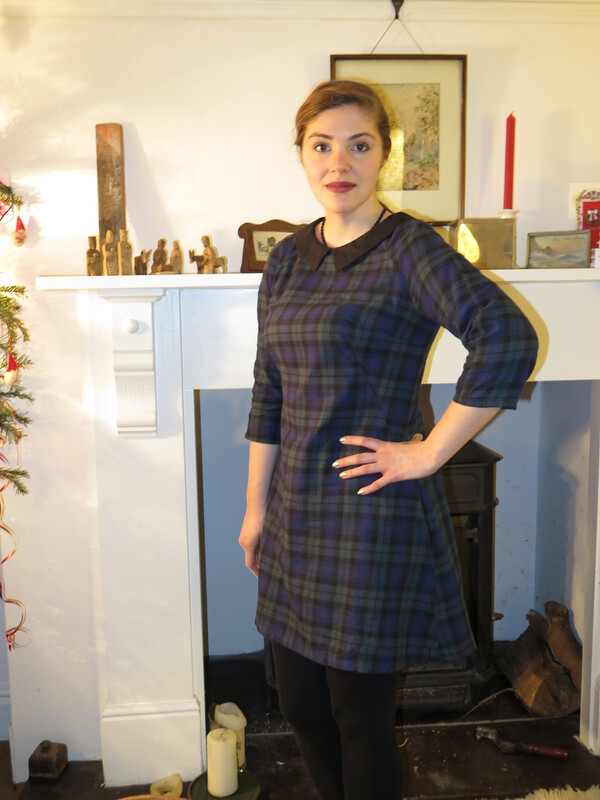 I will definitely make this dress again as I love the shape and if I add pockets (I love practical clothes and wish more came with pockets – adding pockets to anything possible is part of my sewing mission!) I think it could become a work staple. The Miette skirt really proved itself today at my new job – as the newbie it was really handy to be able to carry my notebook and a pencil in those giant front pockets! I think I will be making more of both in the near future but I want to try out all the other patterns in Love at First Stitch first – building up the skills! I’m excited that I think I will have enough room in my new digs to bring my sewing machine and carry on the adventure. 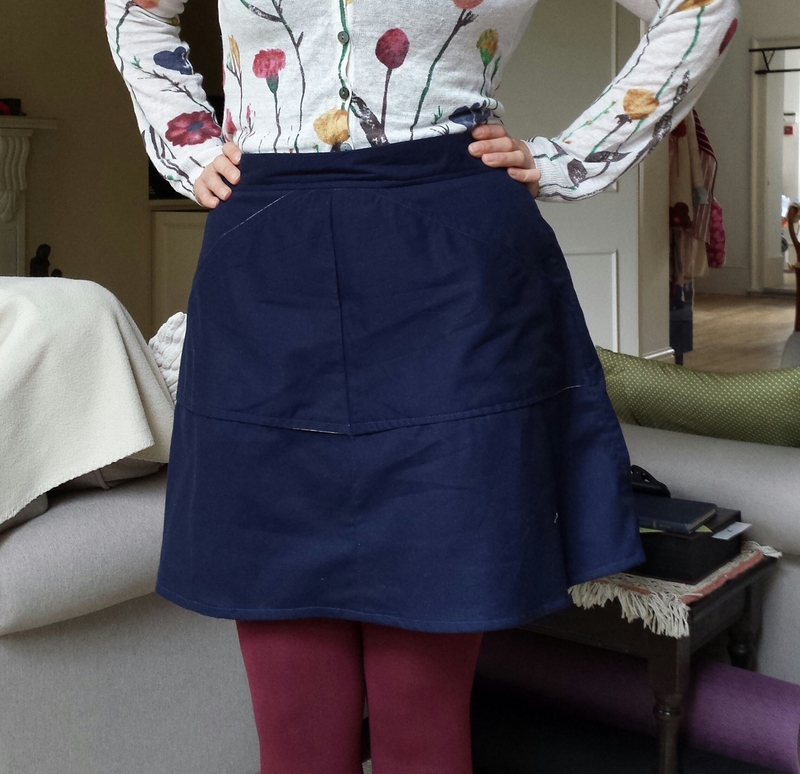 This is the Delphine Skirt from Love at First Stitch. Isn’t it gorgeous? Wouldn’t you love a skirt like this? That is exactly what I thought so I set about making it. Sadly, this was to be my first real sewing set back. Making this skirt was a nightmare. The instructions were clear, as always with Tilly Walnes’ patterns, but everything seemed to go wrong for me on this project. That is, everything except the thing I was the most worried about, which was the invisible zip (more on that later). Let’s start with my first mistake: my fabric choice. This was the first time I’d actually been to a fabric shop to pick a fabric. The fabric I originally bought for this project was part of an online order and everything that arrived was great except what I wanted to use for this skirt. It was described as being brown and on the picture on the website it was a brown and slightly burgundy spotted fabric. What arrived was black with gold/yellow spots. It still looked cool but the gold/yellow and black combo would go with nothing I owned. The shop were understanding and ok with me returning it but I wanted to get started on this project so I decided to brave a fabric shop. I thought that being able to see and feel the fabric, rather than relying on descriptions, is probably a better way of choosing the right fabric for your project anyway. I now realise I have a lot to learn about what the hand feel of a fabric can me about how it will be to work with! This fabric was difficult to cut, was fraying like mad, it was difficult to pin (the pin would catch and push out loops of thread or would simply not go through) and would not take a press at all. The iron on interfacing wouldn’t stick to it either. It was a polyester nightmare. After this, I continued to make a lot of silly mistakes like sewing the incorrect sides together and there was a lot of seam ripping going on. I also think I must have made a mistake with my measurements when shortening the length of the pattern pieces as it ended up being a mini skirt! I had tension issues with my machine and I’ve never had this problem before. It just seemed to get worse rather than better! The hem is an utter mess and should be ripped open and started again but as I’m never going to wear this skirt and it was so stressful making it I’m not going to bother. Because it wouldn’t press at all the hem and waistband are 3D tubes instead of lying flat. I just don’t have the experience yet to fix the many many problems with this skirt. 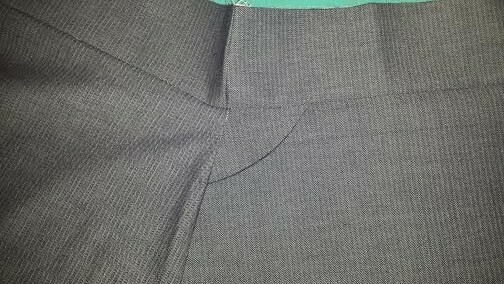 Tension issues – what a messy hem! The one success story is the invisible zip. It is by no means perfect but it went in, I did it first time without having to undo or redo any of it, and when zipped up it is indeed invisible. Huge thanks have to go to my other half for this minor miracle because I couldn’t even figure out how to attach the invisible zipper foot to my sewing machine! The invisible zip went in surprisingly easily! Look at that zip! Oh wait, you can’t see it! At least one good thing came out of this otherwise stressful experience. Another reason this skirt is unwearable for me is the fit of the waistband. I’m not sure if it is down to an error in my cutting out of the fabric or in my construction or whether it is a result of my scoliosis. I love the width of the waistband in the pictures in the book but I’m not sure that thickness of waistband works on me. The waistband seems to fit me at the bottom but gapes awkwardly at the top. I’m worried that that question (“Did I make a mistake, or is it my body?”) is going to be a recurring problem of my sewing odyssey. After I finished my second pair of Margot jammies my order for the Miette skirt pattern by Tilly and the Buttons arrived along with the indigo cotton I wanted to use to make it. Needless to say, I was excited! 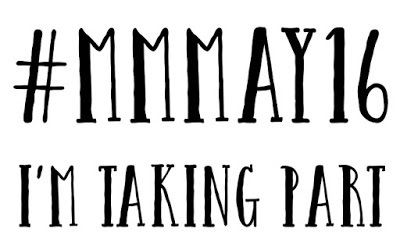 The sewing odyssey continues! My concern about the pattern was the tie front on the wraparound skirt. My body proportions mean my waist is not that much narrower than my torso (and not because they are both tiny, alas!) and I was worried that if the waist of the skirt adds bulk I’m not going to feel confident wearing the skirt. I found these pattern hacks on these blogs: Chainstitcher and Lladybird. These skirts are gorgeous! I thought that a few buttons would resolve my concerns so I decided to incorporate them. I’ve tackled buttons on envelope cushion covers before so I felt (fairly!) confident. 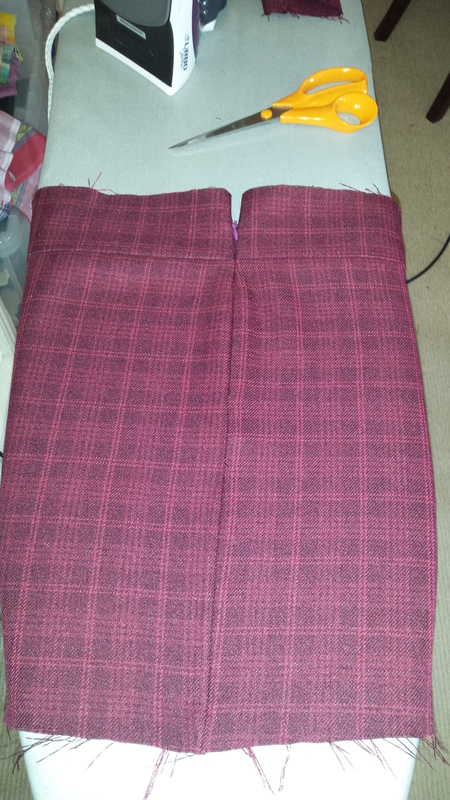 I also had some left over fabric from the Margot trousers so I decided to have a go at giving the skirt a lining. The indigo cotton is a little thin so I was worried it might be see-through in the sunshine and I am a crazy person who likes to dive right in and make things harder for myself so hey, why not?! On the whole, I am massively happy with the results! Hurrah! 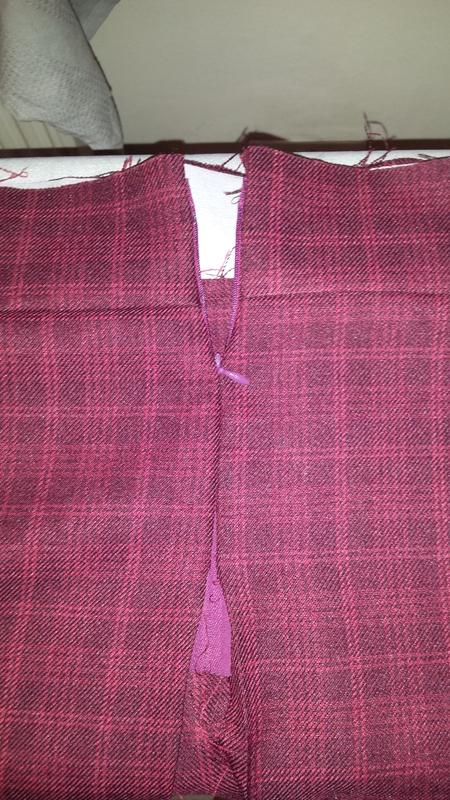 The edges of the waistband, where I deviated from the pattern by not adding the waist ties, are not the neatest. I realised afterwards how I ought to have finished them for a neater finish. I should have taken the time to think about it and figure out the best solution but I was too excited to finish it so I just did any old thing to fix it in place. Lesson learned! 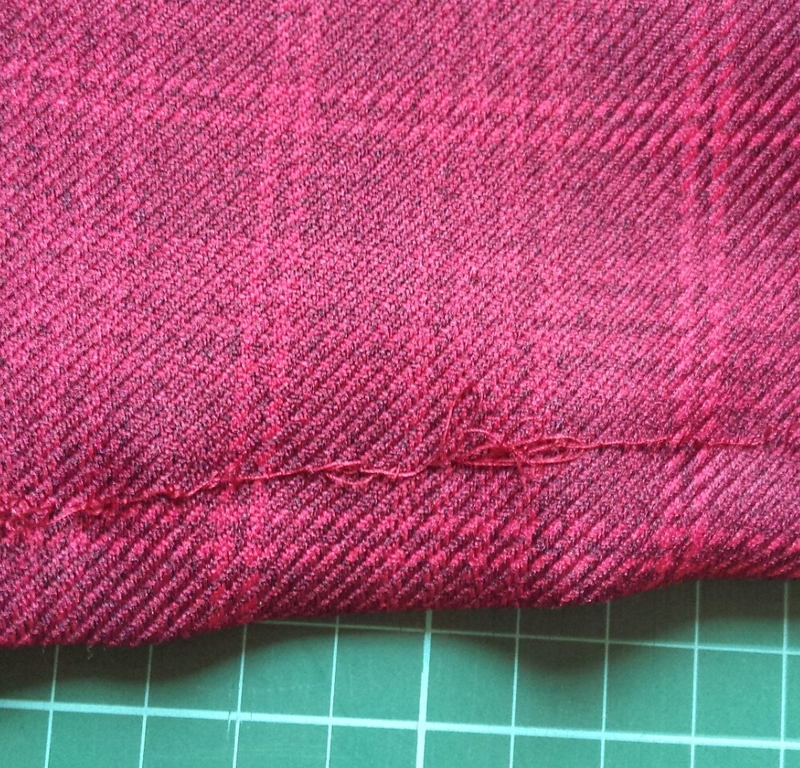 Another lesson was to make sure I really roll the seams to the inside if I’m going to line a pocket like this in a different fabric. I ended up with occasional white lines where the lining peaks out. I still love it though! * Kindle case made from my own hand woven fabric from a weaving experience day, by the way. So, the sewing odyssey begins! The Guardian article that inspired me to finally dust off (quite literally, I assure you) my languishing sewing machine led me to Tilly and the Buttons. A fantastic blog which has a wealth of guidance for the novice. I had no idea how I would take to sewing and Tilly took all the worry out of it. 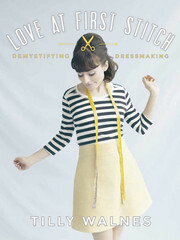 I spent hours each day reading all her tips for learning to sew and ordered the Miette pattern and some dark blue cotton and, ultimately, I bought her book, Love at First Stitch. The book teaches you to sew by taking you through a series of increasingly complex (but all beginner!) makes. You can start with a simple Bardot style headband and work your way up to a lined dress. I read the instructions for the headscarf but I didn’t want to make it. I want to learn but I don’t want to make anything I do not think I would actually wear and the scarf just isn’t my style. 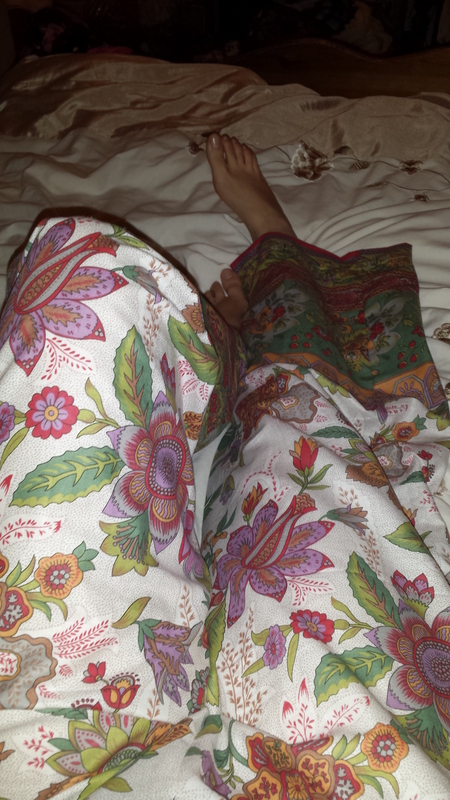 I was itching to get making so I started with the second project: the Margot pyjama trousers. The book arrived really quickly (I ordered the Miette pattern and fabric first, but from a different shop and they took an age to arrive!) and I had no fabric. After a rummage through the flat I found an old table cloth that I didn’t like and got to work! Tilly and the Buttons Margot PJ trousers, poorly photographed in the wee small hours. 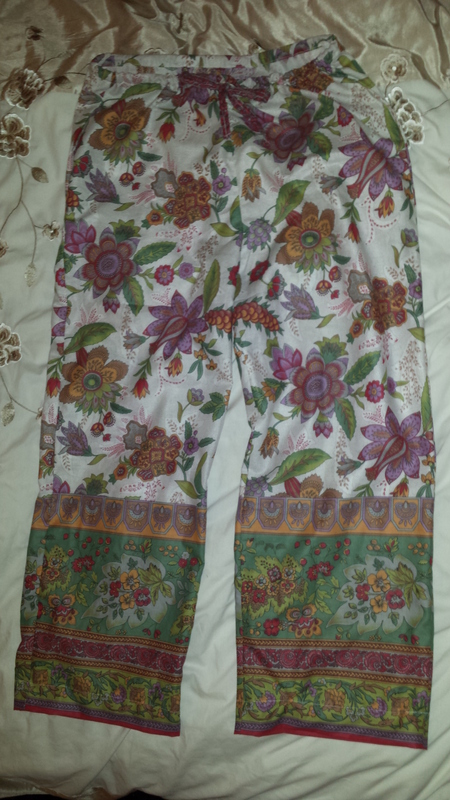 I made the Margot trousers in one sitting. That isn’t to say it was quick (I’m sure a more experienced hand could sew this up in a few hours but, alas, not I!) but just that I was determined and sewed into the night. Not my best laid plan as towards the end I did start to lose focus and make mistakes in my bleary eyed and excitable sprint to the finish. The pattern was really easy to follow but I was disappointed to find I had made some mistakes and misunderstood a bit of the description so I decided that I wanted to get this pattern right before I moved on and made a second pair. This time I got to choose the fabric (one of the real delights of hand-making clothes!) 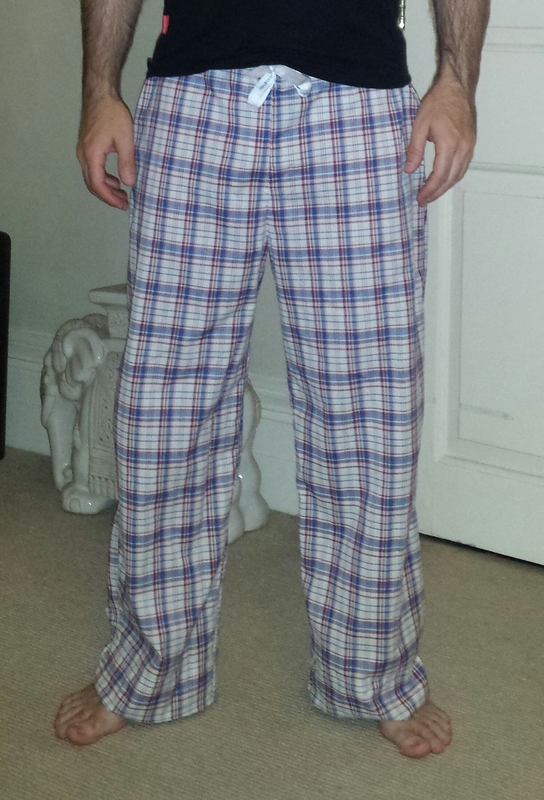 and went for a lovely lightweight cotton in a plaid pattern. I loved working with this fabric, it has such a nice feel to it. I’m really happy with the finished article and I feel confident I can move on to my next pattern.